2017 was not only a positive year for the mining industry, but a defining year. Affordable smaller mining startups were the new way forward and as a result many projects that were either stalled or dragging managed to get moving again. Market trends seem to take shape upon a far faster scale these days and those wanting to take advantage need to move ever faster. We at APT have risen to the challenge with several plant lead time records falling this past year and look forward to pushing this even further this 2018. Time is the new currency of the future, cherish it and be profitable. Wishing a good 2018 to all of our past and present customers, we value your support and we look forward to a continued relationship in the future. If you are looking to get started in mining or are looking for an alternative mining solution, we welcome you to contact us or visit our offices to discuss our offerings and see our plants in-house. This gives you the best vision for your site and a feel for what we are all about. We also have an archive of videos (both recent and older) on our website here which you may find helpful. Mining in Egypt with the APT GoldKacha concentrator has proven to be a success as shown by the recent feedback from our client mining in that region. This particular Egypt mine site is processing material for optimal gold recovery and the client was pleased with the results. We could say much more about this one, but we'll let the pictures do the talking. A previous client said of the GoldKacha "I have used APT's GoldKacha on a variety of alluvial projects in the most adverse and remote locations around the globe and they have proven themselves time again to be the ideal units for excellent recoveries in a multitude of applications. With their low operating costs and used in conjunction with the RG30 mobile configuration, the GoldKacha has been instrumental for assessing alluvial deposits and exploration. They are a must in any miners tool kit." If you are looking to go mining in Egypt for gold or other minerals, APT is worth approaching. We engineer and supply modular mining equipment catering to a variety of locations and environments, of which we will be showing more of here on our website. We currently have an archive of videos of our equipment on site or in-house. These range from recent installations to those dating back to a few years ago. This allows you to truly get a feel of what we at APT do. For videos of the GoldKacha being used on site as well as other gold recovery plants and bulk mineral recovery plants, please visit our videos page here. Well done to the team! Thank you to our clients for their continued and valued support. We look forward to working with you. Our strength lies in that APT has been catering to the small mining sector since its inception when, after working in the mineral testwork sector, it was realized that the equipment necessary to implement our innovations simply didn't exist, or was inappropriate. APT was formed to address this need, thus ultimately addressing the needs of small scale miners locally and then globally. We also started to apply our knowledge and capabilities to larger scale projects and the rest is history! APT wish you happy holidays and all the best for 2018 mining. As the 2017 mining year comes to a close, we wanted to extend our thanks to our valued clients, employees and families for their contribution towards making this year a success. We have thoroughly enjoyed the adventures; having been fortunate to learn, teach, share and visit some beautiful places and people along the way. We look forward to 2018 and wish everyone a joyful end of year! Mining equipment for sale in South Africa has been made simple with APT. If you did not know, APT is based in Johannesburg, South Africa, but we operate worldwide dealing directly with the client in most cases. We work alongside APT distributors across the globe who are well-versed in their territory as well as everything APT, enabling you to find us and them to bring our equipment and philosophy to you. Our Head Office is where we like to think most of the magic happens; we thrive on hearing the hum of the plants being manufactured while sitting on our deck discussing all things mining and admiring everything coming together. As much as you want your mine site to be a success, so do we. With many other mining equipment engineers and suppliers based in Johannesburg and the surrounds, we set out to show what sets APT apart and makes us different. APT was created not as a competitor to pre-existing companies, but as a solution to fill the void that existed in the mining industry. What we wanted to create was a company that offered exactly what was required by the customer, no compromise. In a market that relies heavily upon technology that has stood the test of time, very few are willing to challenge what was, and create what is. APT took this as an opportunity to not only look for new solutions to solve ongoing metallurgical problems, but to develop new processes within our industry. Equipped with in-house laboratories, our own manufacturing facilities and a highly innovative design team, APT has created mineral processing equipment and solutions that are far superior to what is out there. But that isn’t enough for us. We have a continuously running Research and Development team to keep our ideas active, and ensure that our technology is constantly at the forefront of the industry. You may ask how we manage to apply this formula in such a dwindling time for the mining industry. Market trends have changed in such a way that the mining industry is no longer looking toward mass production as the investment simply isn’t there. Rather what prevails as the up and coming are the smaller, risk-averse projects and this is where our fundamental formula will always hold steadfast. There is still a significant amount of activity in this sector and a demand for simple efficient solutions that are fast to get moving and wont set you back immensely on the financial side. We see this as an opportunity for us to deliver our sustainable business solutions to the customer, from start to finish. We do the entire package and are able to follow your ore from testwork, through the design phase, into manufacture, installation and commissioning, all while maintaining close contact with the customer. In a fragile market there is no room for mistakes. We like to offer the security that we are looking after you to the best of our ability. We aren’t a company that goes by the books, running on routine rather than innovation. We continuously think out the box, and tailor our solutions to each individual customer to ensure that what we offer is the best that they can get. We employ a team of highly skilled, experienced engineers in conjunction with some well-educated, fresh faces to keep the new ideas and innovation alive. This gives us a powerful capability to deliver a quality, advanced solution in the shortest possible time and at highly competitive rates. Not Just Fishing For Gold! The end of October proved to be an eventful month for us here at APT, not just in the office but also out in the field. This time, however, it was in a different way than we are used to. APT was proud to sponsor two Hamba Bamba teams at this years’ Kariba Invitation Tiger Fish Tournament (KITFT), one of which was the only exclusively woman’s team for the second year running. Now why would mining equipment engineers and suppliers sponsor a fishing tournament? The tournament began in the 1960’s in Zimbabwe and has been going ever since. We have seen the effort that has gone into keeping such an event going and realise the importance of showing support. Also, it is simply a huge amount of fun and that is something that everyone needs! Both Hamba Bamba teams did us proud, and congratulations from APT to all participants at the tournament! APT – mine for gold, chrome, tin, tantalite & more. APT has been awarded an order for a JCRD100, a hard rock 10 tonne per hour gravity gold recovery plant, heading to Ghana. The client asked for a fast track supply, ergonomic plant to cater for oxidized hard rock free gold on a surface deposit. Emphasis was placed upon having a plant design with a high gravity recovery, small footprint, easy installation, low maintenance and no mercury utilization within the process. The hard rock plant is comprised of a JC100 primary jaw crusher followed by two RD50 wet impact grinders. The crushed product feeds directly into 4 GoldKacha concentrators which are fitted with the Goldilox secure and automated purging system. The Goldilox system ensures security of the concentrates which are fed directly into locked and secured concentrates boxes, while purging is controlled by an ingenious digital timer valve configuration. Periodically, the concentrates boxes are wheeled to an adjacent APT GoldRoom for upgrading on an ST500 concentrates upgrade table. Free gold recovered off the table will be smelted in an in-house P100 furnace. The plant is supplied with a generator, full internal electrical reticulation, internal water and slurry pumps, piping and a water supply pond, all facilitating plug-and-play operation on site. The plant will be manufactured, pre-plumbed, pre-wired and test run at APT's mining equipment assembly workshop in Johannesburg, South Africa and will be ready for shipping by container in a few weeks' time. This is another breakthrough in the mercury free gold processing thrust for West and North Africa. APT recently air freighted a 3 tonne per hour RG30 washing plant also with GoldKacha/Goldilox features to Ghana, as well as supplying the equipment for a mercury free gravity gold recovery centre which is currently nearing completion in Sudan. As always the emphasis is on a fast and thorough build, easy field implementation with clean and efficient recovery of free gold. We look forward to the build and installation of this plant, and a happy client at the end! Congratulations APT team. APT's modular cyanidation plant, the TriTank TT20, has taken off with one being recently delivered to a client in Zimbabwe and another immediately ordered thereafter for a separate client. This plant is currently under manufacture and will be ready for delivery within just two weeks. True to APT, the plant is expected to be well engineered, well manufactured and will run in a far more efficient manner than conventional cyanidation tanks. The TriTank does not have the same design as conventional tanks; it incorporates 6 separate tanks into one neat, modular and efficient plant. The benefits are outlined here and we recommend giving it a read if you are new to the APT TriTank concept. 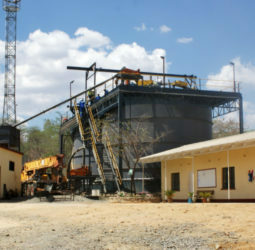 In addition to these entry level plants APT has also received two very significant TriTank CIL plant orders; the first is for a client in Sudan where three TT500 (500 cubic meter each) CIL tanks will be installed on the dissolution train with an additional APT Detox system, also comprising of a TriTank. Below is a video of a similar larger scale modular cyanidation plant, and more on site mining videos can be viewed here. The second large TriTank is for a waste rock retreatment operation close to Johannesburg, where a TT500 will be employed. This installation will be delivered in a record 12 weeks. For further queries, please contact us here on our website, or alternatively email us at info@aptprocessing.com. We look forward to these exciting developments and making our clients proud! “Nigerian mining companies do not need to travel around the world any longer in search of the best technical services” - Click the link to read Nigeria Mining Week's exclusive interview with exhibitor Gbenga Ojo, APT Distributor for Nigeria & Managing Partner of Afromin Consulting Limited. We are proud to be represented at Nigeria Mining Week by Mr Gbenga Ojo, Managing Partner of Afromin Consulting Limited and APT's sole Nigeria distributor. Mr Ojo will be at the Afromin booth, number 106. Mr Ojo stated "as a firm, we are excited about the opportunity to engage the Nigerian mining stakeholders, through Afromin, on the uniqueness of our APT products and how these products are well suited for the artisanal, small-scale and junior miners who, although serious about mining their viable projects, are yet faced with the challenge of raising the large capital required for the developments of their projects. APT is therefore pleased to be providing the modular mineral process plants, as a innovative solution to the emerging Nigeria Mining sector. APT is of the opinion that its partnership with Afromin, does not only provide is target clients with modular plants, but also provides them with a solution that is comprehensive, as Afromin seeks to provides services across the mining value chain in Nigeria, which ranges from exploration program management, contract mining, capital rising, etc". For more information on the exhibition of APT products at the Nigeria Mining Week, please feel free to contact Mr Gbenga Ojo on gojo@afromincl.com, or visit the Afromin booth 106 at the 2nd annual Nigeria Mining Week. If you are on the hunt for a mobile gold processing plant, you've come to the right place! APT engineer and supply modular mining equipment, including trailer versions of complete mining equipment kits allowing you to go from gold or bulk mineral bearing material to the recovered product efficiently and quickly. These mobile gold processing plant kits have options catering to hard rock and/or alluvial material. 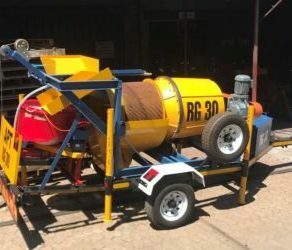 We pride ourselves on having short lead times as we understand the urgency in wanting to begin your mining venture and we are proud to announce that we have just set a new record in fully manufacturing and assembling our RG30-T mobile gold processing plant in a record time of just 3 short weeks, ready to head to our client in Southern Africa. Well done to the APT team! The RG30-T mobile gold processing plant (pictured below) will be used as an exploration module, something it is well-suited to due to its robust and minimalist design, and does not have a crushing section as it will only process alluvial material. The RG30-T includes everything required to go from ore to final concentrate, from the complete wash plant through to the GoldKacha concentrator through to a lock-up section to store your gold-bearing concentrate safely. The video below shows another RG30-T mobile gold processing plant running from start to finish, using a clients sample so they could see how the plant works and their recoveries. All that was done prior to turning the plant on was setting up the trailer, which can be done in as little as 5 minutes. For more videos on site or to see APT's mining equipment for yourself, view our selection of videos here. What you see is reality and in the moment! For further information, contact us here or via email on info@aptprocessing.com. The faster you can make the reaction happen, the smaller the vessel you need to contain the reaction, and thus the lower the capital cost of the plant. The quicker the reaction, the better use you make of the cyanide which decomposes with time. Also the better use you make of the oxygen in solution as oxygen is necessary for the gold cyanide reaction. Better mixing means a more efficient process and more complete reactions. Dissolving the gold is only part of the procedure, in the CIL or CIP process the second part of the story is adsorbing the gold back out of the pregnant cyanide solution onto the carbon. The rate of the adsorption reaction is driven by the concentration of the gold in solution, so getting the barren solution away from the carbon particle and getting fresh gold bearing solution to the surface is very important. In summary, the better the mixing, the better the cyanidation, the more gold you will extract. APT TriTank® is a more efficient cyanidation/carbon system that is proven in practice. Available in 20, 40, 80, 200, 300, 400 and 500 cubic metre capacities. Supplied as complete systems, installed and commissioned by APT. Many claims have been made here, and APT stands by all of them. TriTank is a properly researched and engineered system, not an assemblage of tanks made in the ‘corner welding shop’. A professional metallurgical solution produced by professional metallurgical engineers. Please continue through the paper here to explore the TriTank development and judge for yourself.